A Perfect Match for Natural Teeth Since a dental implant is embedded in the jawbone, it is as secure as your other teeth. And with the convenience of same day dental implants, your smile can be greatly improved in a matter of hours. 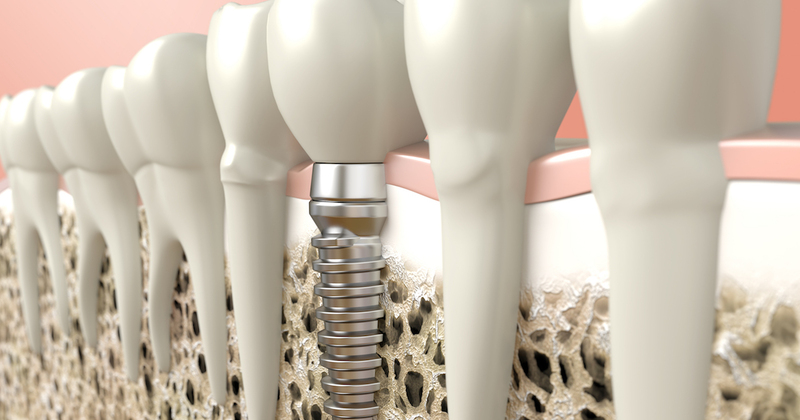 Once the tooth replacement has had a few months to fuse to your jaw, the dental implant will feel completely natural and allow you to smile, eat, and talk with total confidence. Lasts Longer than Other Tooth Replacement Options Dental implants offer a permanent tooth replacement option since they bond with your jawbone. This allows them to last more than 20 years with proper care and cleaning. In comparison, other options like removable dentures and bridgework typically need to be replaced or remade every few years. Even though the cost of dental implants is often higher than other options, their permanence makes dental implant costs more affordable in the long run. Won’t Cause Dental Damage to Nearby Teeth A dental implant’s placement in the bone eliminates the need to stress the surrounding teeth. Yet other tooth replacement options must be supported by those teeth, which can cause them to weaken and decay. This can lead to the need for costly dental repairs and treatment, which further proves the value of the cost of dental implants. Plus, the need to depend on adjacent teeth makes other tooth replacement options prone to slippage and discomfort, where a dental implant is comfortable and secure. Saves Your Smile from Bone Loss Did you know that tooth loss usually precedes the loss of dental bone? Without a tooth in place, the surrounding bone quickly diminishes. This can change the shape of your face and increase your risk for dental fractures, which are additional reasons why dental implant costs are worth it. But simply replacing missing teeth with a dental implant can stabilize your bone and help you avoid these awful problems. And choosing same day dental implants soon after you lose a tooth can reduce your risk completely because the tooth has been replaced in the bone. Carefree Care and Cleaning Keeping a dental implant in top condition merely calls for the same care and cleaning that your natural teeth require. Simply brush at least twice a day, floss on a daily basis, and get regular dental check-ups and cleanings. In contrast, other tooth replacement options require soothing creams or soaking overnight, which are messy and inconvenient. But using the same good oral hygiene you use on natural teeth will keep your dental implant looking and lasting its best.